Pioneer VSX-920 review | What Hi-Fi? While it's had no problem turning out class-leading receivers at four-figure prices, Pioneer has found the midrange a tougher nut to crack. Its products have always had merits, but have usually only been mildly diverting – the sort of glossily finished alternative everyone glances at in the showroom before spending their £500 on a Denon, Sony or Onkyo. The VSX-920 is designed to put a stop to that. It's a smooth looker with a minimalist fascia and a heavily overburdened remote to make up for it. 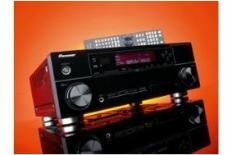 Pioneer has exhibited some independent thinking where specs are concerned: the four HDMI inputs are all 3D compatible, but the VSX-920 foregoes an audio return channel. Cunningly, Pioneer has equipped the VSX-920 with an Ethernet socket – this allows you to fill the 24 radio presets with internet-based stations. It also lets you use Pioneer's swish iPhone remote, which is downloadable as a free app. Otherwise, it's entirely as you'd expect. On-screen menus are crisp and comprehensive, and the trade-off for the interminable auto set-up procedure is a receiver that sets itself to your room more accurately than many close rivals. Charging through the DTS-HD Master Audio soundtrack to Solomon Kane on Blu-ray, the VSX-920 generates a vivid, driving sound with the emphasis firmly on entertainment. The soundstage is spacious, effects are steered quickly and are positioned confidently, and the frequency range is seamless. It's particularly adept with transients (the initial attack of a sound), and describes the leading edge of subwoofer sounds especially well. Those bass notes are solid but not overbearing, and there's good detail to dialogue through the centre channel. As is often the case with Pioneer amps, there's as much emphasis on the upper frequencies as you could ever want, but as long as your speakers aren't similarly exuberant it shouldn't be problematic. Expanding a DVD of Don't Look Now to HDMI/1080p, the VSX-920 is good but not great: some fine detail slips through its fingers and edges are drawn more crisply by other receivers. It's a vibrant and stable picture, though, and the neat, tidy evenness of its Blu-ray soundstage is carried over intact. And after that slight reverse, the Pioneer hits back strongly with its stereo performance. It's not accomplished enough to trouble an integrated stereo amp at half the price, but by prevailing standards it's praiseworthy. Alex Gopher's dance-y You, My Baby and I is poised and punchy, the VSX-920 displaying a deft lightness of touch and strong focus and resolution. It's an agile, engaging performer, well able to take on stereo duties without grating. The VSX-920 is a persuasive option. The lack of audio return might put some people off, but we reckon internet radio will excite many more – plus, of course, it decodes and amplifies to an impressively high standard.